I recognize the Sun in the sky, but this a different world. I cannot hear the whispering of the trees, I do not understand the language the land is speaking. The water is not at peace, it tastes of anger and confusion. The air is filled with death, absolute fear and organized violence. The fact I survived I thank my Ancestors. Not everyone made it; I still hear the screams inside my mind. When I close my eyes, I see death, human mess and people descending into madness. I had to disconnect from my feelings to survive in my own head. No one is the same after you witness the suffering and pain, you start to realize when a man or woman is taken, that they probably will not be returned back. I do not understand what the group of thieves are saying; I look at their expressions on their faces. They make sounds; I check their gestures to avoid the violence. I understand the universal language of fear. This is not the place that you look for someone`s better nature. This is an organized operation, they are trying to break our will to fight, I am a warrior, and I choose my battles and await my chance. I am a prisoner of war. I have been stolen from my homeland. I am the property of no one; they chain me to restrain me. Our village was not prepared, we were outnumbered, and we had no disagreement with them. Our nature is not to start a battle without any reason. We are a tribe; we describe what we see in our own language. We are a kingdom of hundreds, not thousands we had to face in war. When I spoke to others on the journey, I realized our lands was conquered one tribe at a time. As I stand on the raised platform, I hear men with skin of many colours making patterns of different sounds. I hear people raise their voice and bidding in different languages, then the people are pulled by chains away. It is clear we are being sold, what the future holds, I do not know. I will try to escape at every opportunity. I will do what I need to do to be free, however I am not sure who is my enemy, I know those that brought me here are not the real masters. Everyone can see in my eyes I will run if you take off these chains. I have no way to communicate with these new people. They keep making this same sound and then looking at me to respond, with time I understand that this is the name they are going to call me. It is all about the pain that is used to persuade me to do whatever they say. I began to learn their language for my survival. There are not many of us here; they are watching our ways and trying to understand us. I feel like an animal that is being studied for ways to break me. My intelligence is not required in this place; they measure our intelligence by how well we speak their language. Where I come from it is based on the individuals understanding. We measure the control over your emotions, the wisdom you can raise from deep within our minds and the understanding we have of the energies that created our environment. I am forced to mate with women I do not have feelings for. It is the strongest male matched to the strongest women. They want out children to be more productive. They have given up on totally breaking us, we have seen too much, we will never trust them, the future generations they will have from birth to mold and accept they are slaves. I have come to understand that the sound by which they call my Christian name. It comes from a book that tells story of a man who died to save the world as we have sinned by having relations with before marriage. They speak of a God that loves us all, that sees everything and if you are good you can live in his house in Heaven. If we do not follow his ways we will be punished in hell forever. This God is a vengeful god as well as merciful god to those who follow his laws. The book is the word of this God. As captives our traditions are now deemed of this devil we have not heard of. We as well as our children are punished from practicing our ways. They want our children to become Christian and lose the connection to us and our Ancestors ways. I have received many beatings to encourage me to change my ways, however no one can convince me, this God loves us in slavery. He seems to reserve his mercy for the ones who holds us captive. No matter how evil they are this God does not punished them. As regards to he who died to save the world, I wish he was travelling on the boat that brought us. I wished he could have saved the Ill and pregnant women as they were thrown into the sea. When it comes down to slaves, it seems this God and Jesus lets everyone have their way. I still do not understand why no women energies are mentioned. When it comes to heaven and hell its sounds like life on the plantation, where the more you are obedient to slave master the closer you are to the comforts of his heavenly house and further away from the hell hole in the ground. The land owner is the lord we worship and he sees everything we are doing badly; we are regarded as evil and of the devil when we speak against him. The better you work as a slave, follow the rules, watch what you say, the better are your chances of getting into heaven on the plantation. If you challenge the lord of the land, the hole in the ground will be your destination, this sounds like hell to me according to that story. I fear for my descendent as they will have wiped out all traces of me. Our children will not know our cultures or our languages. They will be telling stories of people in the bible and not those from our village. We had no one in our village called John or Matthew. The connection to their Ancestors will be lost with all their understandings. They will believe Jesus is their saviour forgetting how their Ancestors were slaughtered. How they could be born in sin when we were forced to do this by those who introduced the religion, they have taught this type of belief to the children as a mental insurance. This religion puts your focus in man, whilst those from our land have a relationship with women and nature. The slave master chose this religion as it suited their purpose. They now have established themselves as the lords on their plantations; they can foster the love from within many of their slaves and make them willing to report on those who are non Christians. They have been taught to reject all other traditions as evil and attack those who dare to question their lord. It takes many generations to create this hate and fear of your original family. They will even call those who speak of their ancestors as devil worshipers and followers of Satan. No condition is forever, I know that things will eventually change; the power of the Ancestors is never sleeping. Within each group of children, there will be one who they can see through the shame. They will always challenge and question why people are suffering. Deep within their minds they will be able to access the knowledge from the depth inside their soul. They will able to speak of things remembered from their past lives. The restrictions on their minds that other people do not want them to find will cease to hold them back as they grow older. There will always be those prepared to sell another person`s consciousness for profit, they will use fear and intimidation to stop the persons search for answers. They will use people`s natural desire to understand the element of creation within to themselves to exploit them and make that money which cannot be transported to any god. This is not about skin colour; all the big religions had a hand in this trade. 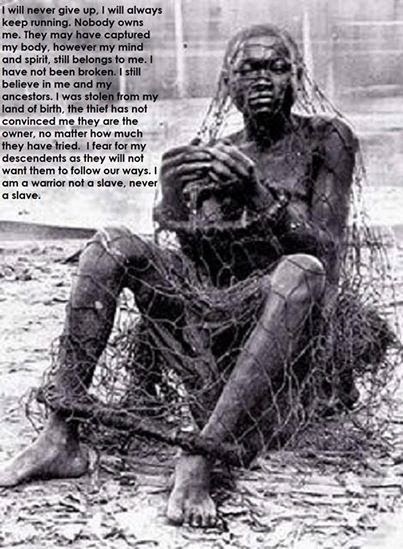 No one can claim total innocence as regards to slavery. One day I hope that all the truth becomes available for all to see, that mankind can return to a higher standards. To own another person is the embodiment of evil in all forms, I hope my descendents are mentally free to return to their Ancestors. Picture quote: "I will never give up. I will always keep running. Nobody owns me. They may have captured my body, however my mind and my spirit still belongs to me. I have not been broken. I still believe in me and my ancestors. I was stolen from my land of birth, the thief has not convinced me that they are the owner, no matter how muchthey have tried. I fear for my descendants as they will not want them to follow our ways. I am a warrior not a slave, never a slave." Article via Ancestral Essence facebook page.